Chillingo has been pretty quiet lately but they are back in action, publishing PlayFlame’s physics simulation style game, Zombie High Dive (Free). PlayFlame’s debut game mixes the launch trajectory component of Angry Birds (Free) and the wind resistance air rotation physics of Bouncy! Trampoline (Free). We can’t draw too much from the history of the developer, but the publisher is one of the most prolific in the business. For better or worse, the game brings what you would expect from EA owned Chillingo: Full facebook integration, highly stylized art, music and sound work, with hopefully some intriguing gameplay. The character you play is a zombie with an unexplained desire to dive competitively. Dives are conducted in either training with an instructor or competing in leagues that accept you once you reach various goals. Every time you go to a dive location, you are charged a ticket, one of the game’s three currencies. You perform a number of dives, usually to reach a point value. After the introductory diving tutorial, you approach a seedy looking zombie that offers his services as your agent. The game uses him to deliver most of the bad news about this game. Yes, there is a timer to get more tickets. Yes, you are going to get pressured to link up your facebook. Yes, you will be redirected to the currency store if you run out of tickets. Hell, even if you don’t run out of tickets. It’s kind of a smart idea to use an in-game personality to be the bad guy. I mean, it would be even better to not have to have him at all, but at least now we don’t have to break immersion to get a limited time offer from the item shop. Your agent arranges for your participation in various leagues and lines up instructors to train you. Well… ostensibly that’s what trainers are supposed to do. In practice, trainers are a nice big wall that you have to overcome in order to continue playing. You have to successfully land 8 different dives of increasing height and complexity. If you fail more than 3 dives in your climb to the top, you must either start paying out the game’s 2nd type of currency, brain biscuits, to bribe the judges or you have to start over from the first dive and burn another ticket. Why do you need a ticket to train with an instructor your agent lined up for you? I still haven’t figured that out. Once you have access to league competitions, you will be pitted 1v1 against a cast of npc zombies in each match. You do not, however, actually get to see the dives your opponents complete. League matches differ from training only in that training is a little more forgiving by allowing 3 missed dives before failure. Once you tap past the banter screen in which you see a few lines of conversation text, you are only given a score total you must surpass. The most original banter you will see in the game is a reference to a body part and then a zombie admitting that they lost or misplaced that body part. There are also some typos that managed to pass a spell check. The diving itself feels pretty solid. 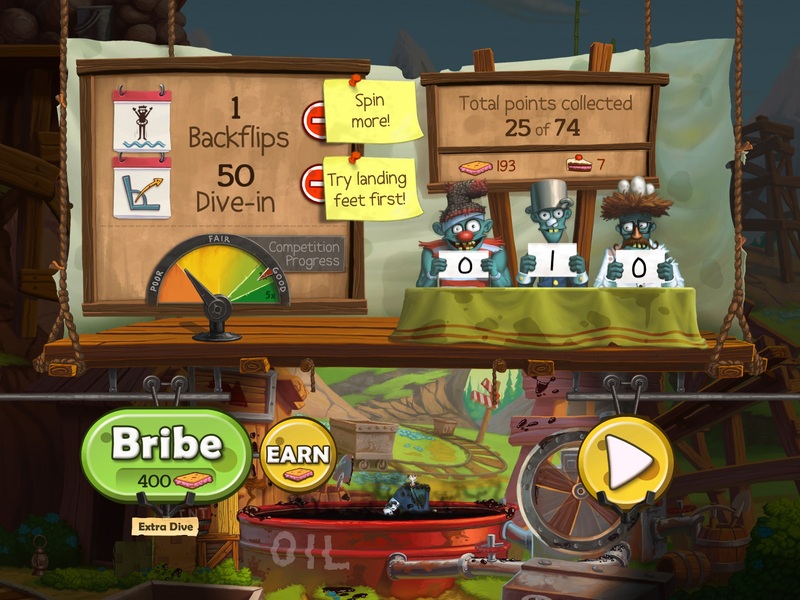 You use the Angry Birds style pull back and launch mechanic to initiate your dive. Once airborne, putting your finger on the screen increases spin speed, while letting off decreases spin speed. Each dive is dictated to you in how many spins you need to do and whether you should land feet or head first into the water. You are scored based on how straight you landed and if you did the required number of flips. The game offers enough complexity that you need to concentrate on how high up you are and how fast the wind is moving. One problem I have is that very rarely I will stick a great dive and not get credit for a good dive. Dives are scored in such a way that every single score counts. There are no averages or dropping the lowest and highest scores like Olympic dive scoring. While this seems like a minor point, it is important to keep in mind that a failed dive means that you will lose a match unless you pay for another dive or fail the match and spend another ticket on the match. A single botched dive in a league match means you will be spending currency. Given the hard push to the currency store, Zombie High Dive is surprisingly light on what it offers a player looking to spend currency. I haven’t mentioned the third currency of the game, brain cakes, because all they are used for is to buy more tickets. The total sum of what you can purchase is more diving, of one flavor or another. After almost every match you complete you are greeted with either a game ad or your agent asking you to buy something from the store. There are no indicators that tell you purchases will remove ads, and the ‘free currency for watching more ads’ feature is not yet working. You can buy extra dives once you are in a competition, and you can buy extra tickets when you are waiting for more to replenish over time. Bouncy! Trampoline for example offers many purchases that upgrade your spinning and jumping ability, change appearances, or do both. A big part of meeting the increasing difficulty in games like this is making intelligent upgrade purchases that allow you not only greater control, but the ability to perform greater feats of death defying stunts. The only cosmetic upgrade available in Zombie High Dive is a diving tower skin that becomes available by doing the facebook only competition. You might have noticed that the time I spend in this review on the actual gameplay of this game is pretty limited. After reading our forum thread I realized that the gameplay isn’t the focal point for me. I find the gameplay enjoyable, if a little shallow and unforgiving, but there are a lot of barriers to actually get to the meat of this app. You are only given 4 tickets to start out with, with a fifth ticket that can be regained only by using brain cakes to purchase tickets. Each ticket takes 20 minutes to replenish. Like I said before, you must burn currency to buy additional dives even while you are within a match. There is no point at which you can even practice without burning currency. Ultimately it is these limitations which define the game for me. 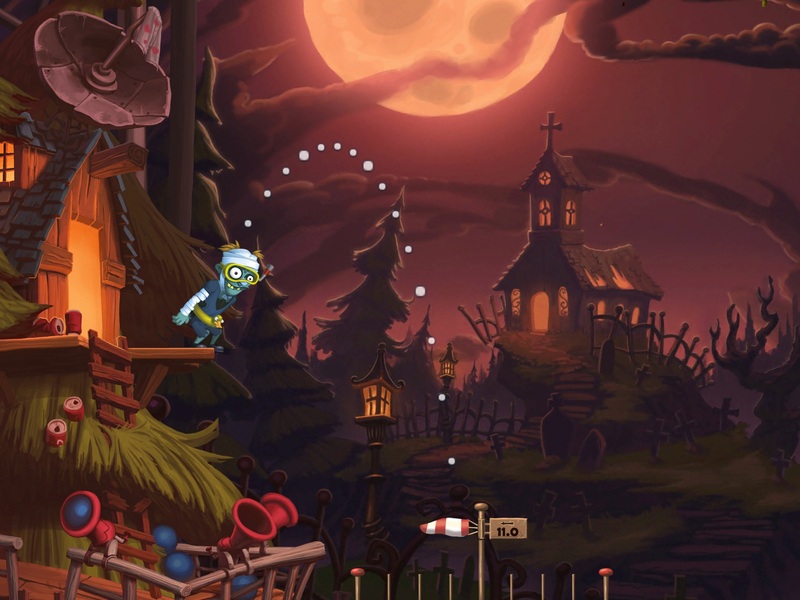 Zombie High Dive holds the reins too tightly for me to sit back and enjoy the simple physics game this could have been.